Jaeger-LeCoultre has just unveiled an online personalisation service for its iconic Reverso, which celebrates its 80th anniversary this year. The swivel case of the Reverso makes it a perfect choice for custom decoration on the case back, be it enamel or engraving. JLC offers initials, coat-of-arms, maps, various motifs and a few of the simpler ones are available online. 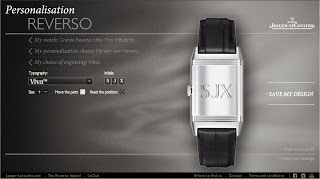 The site allows the user to create a mock-up of a personalised Reverso. While quick and painless the online personalisation engine lacks the romance of doing it in person. I have a mental image of a client visiting a Jaeger-LeCoultre boutique to select an engraving, choosing from a thick book of images, including personalised Reverso watches belonging to long dead famous people. And sitting on the table is a tray of delicately engraved sample cases. And if there is nothing suitable the sales person will offer some erudite and clever suggestion of incorporating some personal symbol in a special motif.